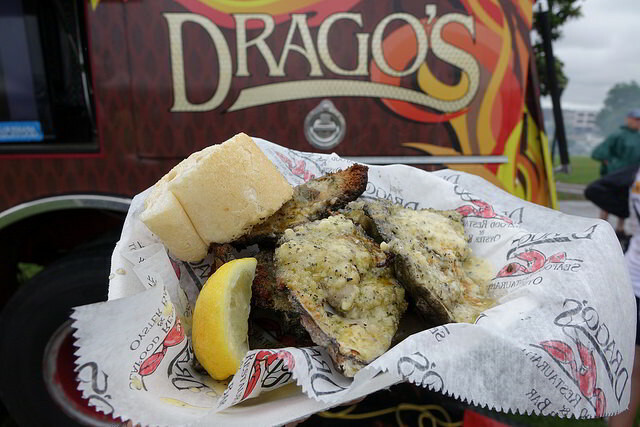 New Orleans Oyster Festival: What to Eat! New Orleans Oyster Festival takes place on Saturday, June 3 and Sunday, June 4, 2017 at Woldenberg Park at the Mississippi Riverfront, next to the Audubon Aquarium of the Americas. As usual, our prime French Quarter location means you can walk to and from the venue in ease: our hotel is just about a five-minute walk from the park. We also have a host of ways for you to cool down after the free, outdoor festival, whether splashing around at our rooftop pool or sipping a Pimm’s Cup at our iconic Carousel Bar. Oyster Rockefeller Pasta from Desire Oyster Bar is a delicious spin on the typical seafood and white wine variety, while Oyster Jambalaya from Don’s Seafood puts a tasty twist on the classic New Orleans dish.  If it’s po-boys you seek, you’ll have plenty of options to choose from, with restaurants serving up everything from traditional Oyster Po-Boys (Acme Oyster House) to Oyster Rockefeller Po-Boys (Oceana Restaurant) to BBQ Oyster Po-Boys (Red Fish Grill). 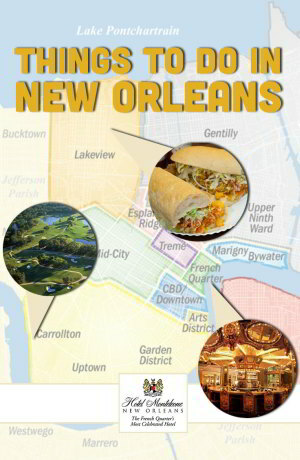 Tons of restaurants will be at the fest, so look out for French Quarter favorites like Antoine’s and Royal House plus incredible restaurants from elsewhere in the city like Superior Seafood in Uptown, Katie’s Restaurant in Mid-City and Jacques-Imo’s Cafe in the Riverbend. Need something sweet after your oyster-filled meal? Enjoy a snowball from NOLA Snow or a treat from Haydel’s Bakery. Festivals aren’t festivals if they only have food. That’s why New Orleans Oyster Fest has secured some of the city’s top talent to play at the riverfront during the course of the festival. Local favorites Bonerama and Flow Tribe are the main stage highlights of Saturday afternoon. Sunday morning starts with a soulful gospel performance, with Brass-A-Holics and Bag of Donuts finishing off the day. 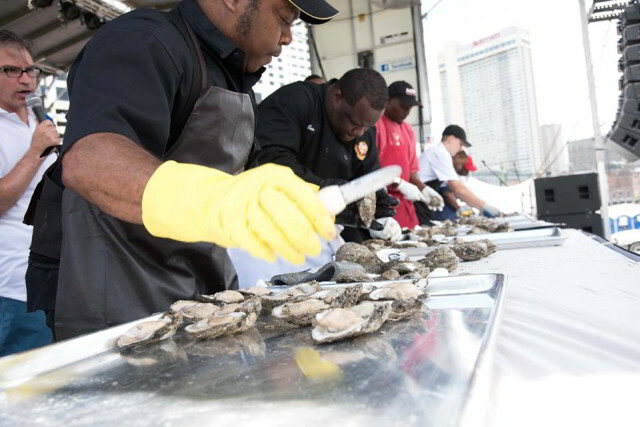 In addition to music, you’ll also find several oyster-related competitions. Watch the oyster-shucking contest on Saturday or the oyster-eating contest on Sunday for even more entertainment. A second stage also features cooking demonstrations early in the day followed by brass bands in the afternoon. Local oyster farmers also compete for the title of “largest oyster,” with the winning entries on display throughout the festival under the Cultural Tent. In 2016, the winning oyster weighed in at an astounding 2lbs 12oz and measured 8″ long and 4.24″ wide! A hand-picked selection of local craft vendors offers up oyster-inspired merchandise like oyster jewelry, ceramic oyster shells and cooking accessories, oyster shucking boards and even oyster socks from Bonfolk Collective. Whether you crave more seafood options or live entertainment after the fest, our hotel has you covered. If you still haven’t had your fill of oysters and fresh seafood, enjoy an elegant dinner at Criollo Restaurant, prepared by meticulous chefs. 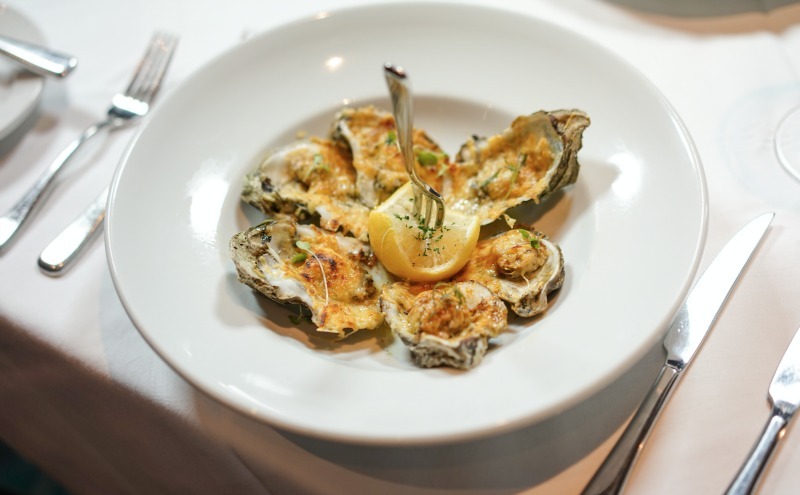 Our very own char-grilled oysters feature a delicious garlic & herb butter and Parmesan crust. Enjoy scrumptious seafood entrees like Seared Perdido Pass Snapper with jumbo lump crab or Baked Stuffed Creole Redfish with crabmeat and green tomato crust. Afterward, head to our Carousel Bar & Lounge for craft cocktails and live jazz music. 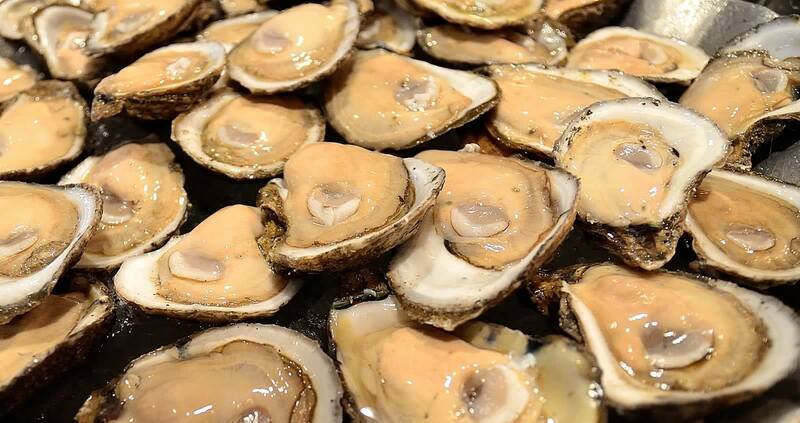 The New Orleans Oyster Festival is just one of many summer events taking place near our hotel. Be in the heart of the action and book your summer getaway today!